Heraeus Noblelight, one of the technology and market leaders in the field of specialty light sources, launches the latest development in its Photoionisation Detector Lamps (PID) range: a 10.0 eV PID lamp which offers increased detection sensitivity in BTEX determination. “A CaF2 filter is attached onto our standard 10.6 eV PID lamp that permits output of the 10.0 eV line but blocks transmission of the 10.6 eV line. In BTEX determination, the advantages are better selectivity than 10.6eV and increased sensitivity compared to a 9.6 eV (Xenon filled) lamp, because of higher output intensity” explains Russell Fear, PID Product Manager of Heraeus Noblelight Analytics. Careful selection of materials and attachment of the CaF2 filter window are critical to produce consistent and high performance lamps. This lamp still maintains the high spectral purity and long life that is a feature of Heraeus PID lamps. Heraeus PID lamps offer an excellent lifetime and are proven to last more than 8000 hours. PID lamps are most commonly used in Hand-Held Gas Detectors for VOC detection, gas chromatography (GC), trace gas monitoring and sample ionisation for mass spectrometry. 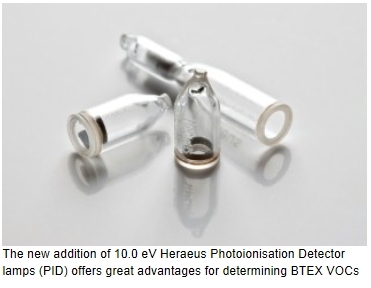 A detailed Application Note from Heraeus gives more information on the new 10.0 eV PID lamps for BTEX determination.